We are now less than half a year away from the release of Early Man, the new feature film from stop-motion legend Nick Park. We've had a long wait since the last Aardman Animation film 2015's Shaun The Sheep Movie- but it's been an even longer one since Park last occupied the director's chair himself. For that, we have to go all the way back to 2005's Oscar Winner Wallace and Gromit: Curse Of The Were Rabbit. A few months ago, a first teaser introduced us to lead cave-man character Dug (voiced by Eddie Redmayne) and his pet pig Hognob. Now, the first trailer introduces us to his world- and the wider story. The trailer starts with introducing us to Dug's contented stone-age life, living with his tribe which appears to be full of typically larger-than-life Aardman characters (voiced by an All-star cast of British talent). We are then introduced to the villain of the piece, the dastardly Lord Nooth, ruler of a Bronze Age city- voiced, unrecognisably by Tom Hiddleston. A culture clash ensues, which brings us to the film's Big Idea. 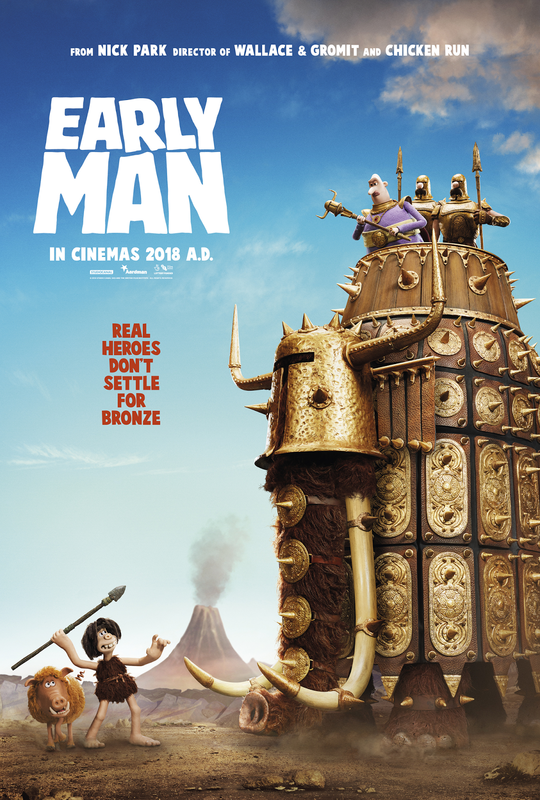 It's one that is hinted at by the film's original title Early Man United. Rather than climaxing with a traditional action set piece, Dug and his Tribe will take on Lord Nooth's team in a football match ( or Soccer for our American readers), or at least some kind of prehistoric version of it. This is looking to be every bit as wonderful as we could have hoped for. Early Man will be released in UK Cinemas on January 26, 2018 via StudioCanal. Aside for Redmayne and Hiddleston, the cast also features Masie Williams, Richard Ayoade, Mark Williams, Timothy Spall and more. The US release will follow on February 16. A new poster has also been released, which you can check out below.